Hampton Inn Mount Dora hotel 3-star 3-diamond property is located on US 441 1 mile from the downtown Historic District of Mount Dora Florida. We are 35 miles from Orlando International Airport and 11 miles from Leesburg Regional Airport. Mount Dora Florida area attractions include golf courses shopping and antique malls and Disney World. Within 1 mile you can dine at Lampu Japanese Steakhouse Goblin Market Gables Palm Tree Grill Frosty Mug Windsor Tea Room and many more. 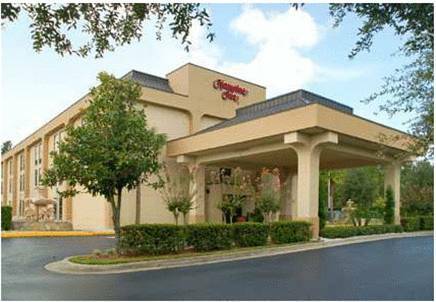 Hampton Inn Mount Dora hotel features 62 hotel rooms meeting facilities for 40 -60 people fitness center whirlpool and outdoor hotel pool. Amenities at our Hampton Inn Mount Dora hotel of Florida include complimentary hot breakfast 24-hour coffee - fruit in hotel lobby in-room coffee maker hair dryer iron - ironing board microwave/refrigerator and 27** TV with an extensive cable package that includes 3 different Showtime channels and wireless high-speed internet in all hotel rooms and throughout the entire property. Hampton Inn Mount Dora hotel of Florida also offers connecting hotel rooms rollaway beds and cribs. Laundry/valet services guest laundromat and meeting/banquet facilities are available at Hampton Inn Mount Dora hotel for a nominal fee. We love having you here at the Hampton Inn Mount Dora hotel in Florida. all reservations must be guaranteed with a major credit card or advanced cash deposit to hotel regardless of time of arrival. all reservations must be cancelled by 6pm host time unless deposit required. Policy subject to change. ALL RESERVATIONS MUST BE CANCELLED 24 HOURS PRIOR TO HOST TIME UNLESS DEPOSIT REQUIRED IF THIS RESERVATION HAS BEEN MADE ELECTRONICALLY PLEASE CANCEL IT ELECTRONICALLY TO AVOID CONFUSION AND A NO SHOW BILL policy subject to change. ~27 miles from Mount Dora. ~35 miles from Mount Dora. ~39 miles from Mount Dora. ~46 miles from Mount Dora.